Our 2017 Collection Has Arrived! There’s no better time than summer to embrace originality in fashion. In honor of new adventures, the Casana team is proud to announce the arrival of our 2017 collection! We believe that fashion should always strive to be part of someone’s personal narrative. Our latest releases are a testament to this; each design has a history all its own. We’re unveiling several new product lines within our 2017 collection, all crafted with different styles in mind. Wherever your journey takes you, we’ve got you covered. CLASSIC: Some looks are simply timeless. The old souls among us know this very well. Our classic scarves are made of deluxe Himalayan cashmere, hand-embroidered by Nepali and Mongolian artisans. These elegant designs include traditional beadwork and perfectly symbolize a meeting of the minds between Eastern and Western philosophy. You can find some of our favorites from this line on the website now. CONTEMPORARY: For those who enjoy modern twists on their favorite accessories, we've added bold contemporary designs. These chic scarves combine decadent cashmere with shimmery Lurex, creating a dramatic look that lends the wearer an instant spotlight wherever she goes. You can find some of our favorites from this line on the website now. SOLID: Certain items are in the fashionista's handbook - you must have a little black dress, a crisp white button-down, and a great pair of jeans that ages like fine wine. We say, add a bright-colored solid scarf to that list, and you'll be forever on point. These accent pieces are made from the softest cashmere available. Slip one on and let its fresh, energizing vibes inspire you. MELANGE: One of Casana's core beliefs is that fashion should enhance your natural beauty. 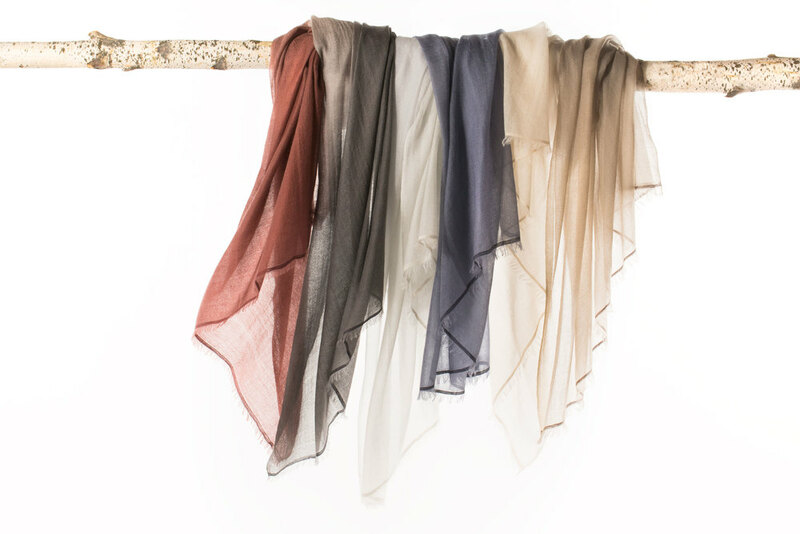 There's nothing more natural than these gorgeous dye-free scarves. Feel closer to earth with designs that retain the essence of their Himalayan roots. Zen moments have never looked better. PRINT: Want your outfit to make a statement? You'll love these patterned scarves, each one an eye-catching work of art in lightweight cashmere. From traditional Mongolian designs (like the intricate ikat) to brilliant splashes of color, the pieces in this line will easily help you piece standout ensembles together. LUXURY FUR: As a classic fashion campaign used to say, "What becomes a legend most?" The answer was then and still is, "A little fur, darling." True, this glamorous style isn't for everyone, but if you're eager to embrace your inner movie star, these cashmere scarves mixed with luxurious fur are your ideal wraps. The wide variety of solid colors and print designs within this line will surely make you ready for your closeup. BABY PRODUCTS: Casana products truly spring from love (our founder, Carrie Chen, was inspired to start the company while bonding with her daughters). So it's no surprise that our 2017 collection includes items for the most precious members of your family. Babies will feel instant comfort when they're wrapped in our super-soft cashmere throws. These lush blankets come in several different colors and traditional Mongolian prints, all of which keep your little ones happy and safe - even when mom has to step out of reach. TRAVEL SET: At Casana we love connecting you to your next adventure. With this line of ready-to-travel products, you'll be jetting from one city to another in fabulous style. In our versatile cashmere, you'll feel like a citizen of the world in no time. PONCHOS AND WRAPS: Want more coverage? We're wild about scarves, but sometimes a girl needs a slightly more substantial wrap. We get it. That's why our ponchos give you the best of all possible worlds - same glorious cashmere, new structure and durability. They're perfect transitional pieces for when seasons change and summer starts fading into fall. Thanks for being friends and fans of Casana. The adventures are just beginning. Newer PostOn Location in Nepal, Part 1: We Kathmandu!